Let’s face it; we are getting to the point where the likes of Cervelo, Specialized, Trek and others are going to be hard-pressed to ring any more aero gains out of a “traditional” double-diamond frame shape. 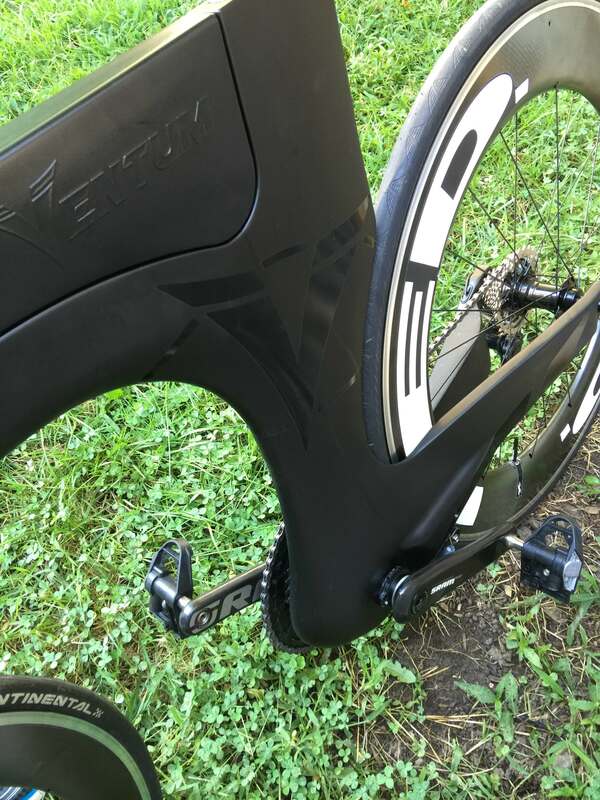 The top aero bikes are converging on each other’s designs, and aero differences are becoming negligible while many of the bikes are a nightmare to live with and work on. 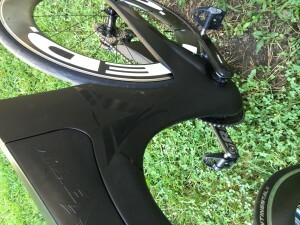 Not to mention, the benefits of a good fit will always outweigh aero equipment tweaking. But assuming you are dialed in, if you are looking for that extra bit of aero magic there may be only one way to go – backwards 20 years to the “golden age” of aero. 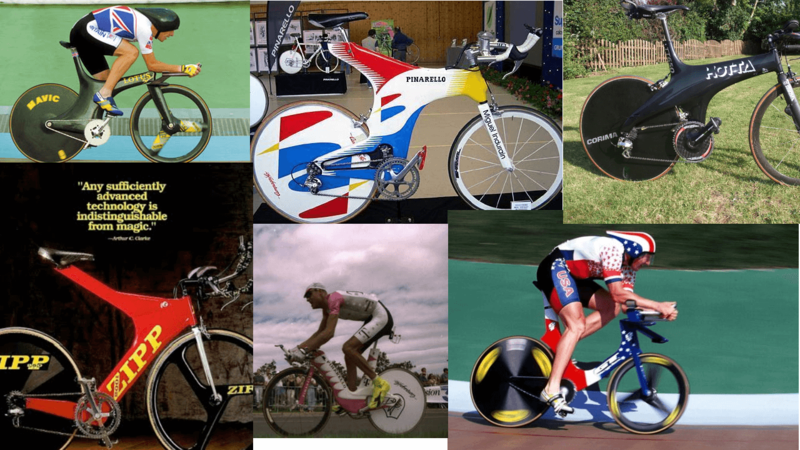 The 90’s produced many iconic aero bike designs: the beam (Softride and Zipp), the Z frames (Lotus), Pinarello’s bizarre shapes as ridden by Miguel Indurain and Bjarne Riis (which also worked quite well as a frisbee when Bjarne tossed his over a hedge in a fit of rage during TDF time trial), and many others like Hotta and Corima. Then, the UCI’s Lugano Charter ruling quickly killed any frame that didn’t consist of a “double diamond” design. Hence these weird yet aerodynamically beautiful shapes were relegated to the pages of history (or Google). I have an original Softride Power V beam bike (now on display in the shop) that I still think is the fastest bike I have owned at least on flat courses. 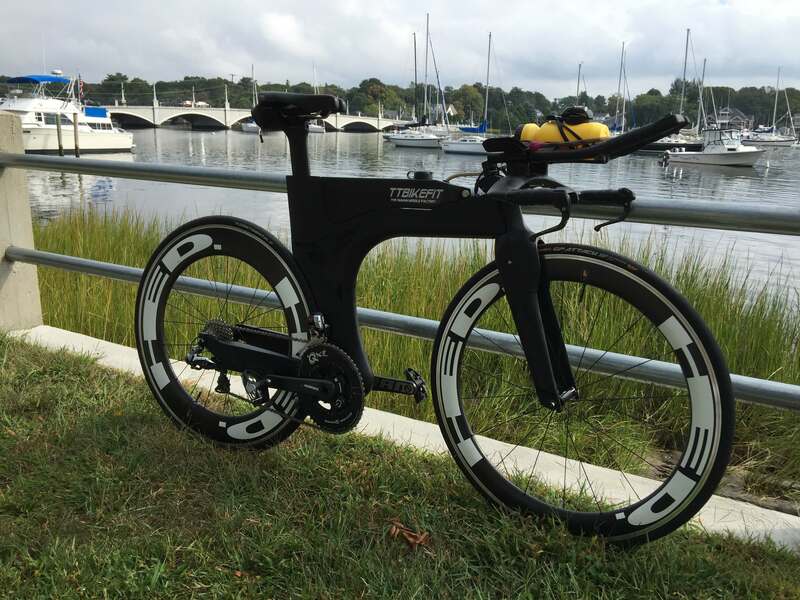 Luckily, triathletes need not play by the same rules as bike racers (most of the time – except in ITU races), and recent years have seen the return of the beam bike (Dimond and Falco), and now, the Z frame in the form of upstart Ventum’s “One” tri bike. The Ventum One clearly echoes the iconic Lotus 110 Sport bike of the mid 90s (other than the steeper tri-based geometry of the One). Seeing as the 110 set hour records under both Colby Pearce and Chris Boardman, it seems like a good place to start. 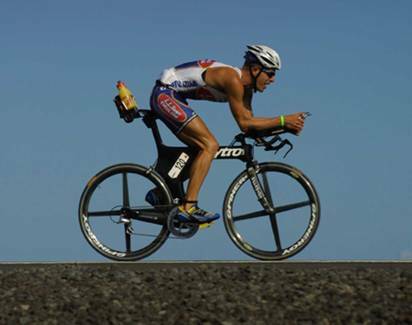 Steve Larsen even raced a 110 in Kona before his untimely death. Anyone interested in TT bikes in the mid 90s lusted after the Lotus, so when I first got a look at the Ventum I took notice. 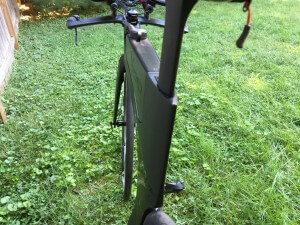 time spent on head to head bike testing was really insufficient to cover all the bases of a rigorous, publishable test. But it DID provide some very suggestive data that the One is super aero, maybe more aero than just about anything out there. I have the data. It would raise some eyebrows. It won’t likely ever be published. But I have no doubt that Ventum will visit A2 once again with this goal in mind. Or perhaps a neutral party will test a Ventum. 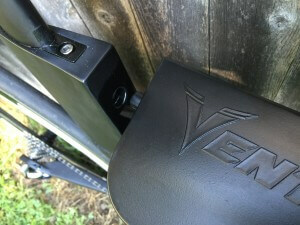 In any case, I was impressed enough to ask them if Lisbeth could possibly ride one in Kona this year, and to our delight Ventum came through for us. The Ventum frameset incorporates a fork with a standard steerer tube so that any traditional front end can be used on the bike. 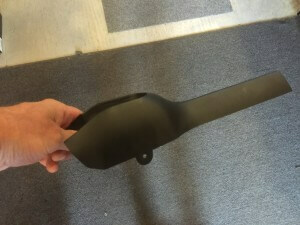 However, it does come with a proprietary stem and bar combo that makes for a very clean leading edge. The basebar bolts to the stem with 4 vertical bolts, and the stem attaches to the steerer in the traditional way. 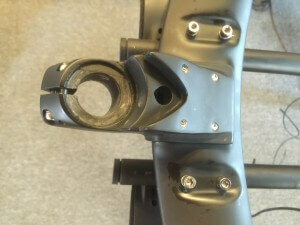 The fork incorporates a faring that covers the TRP V-brake and runs upward to the stem to hide the brake cabling. This also provides a place to stash the Di2 Junction box. 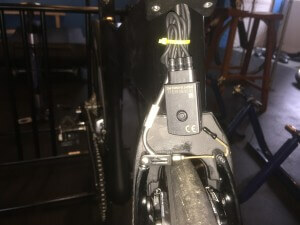 The stem has a hole in it to pass the brake cables and Di2 E-tube wires through. The stem also has a carbon cover which serves as the steerer cap as well. 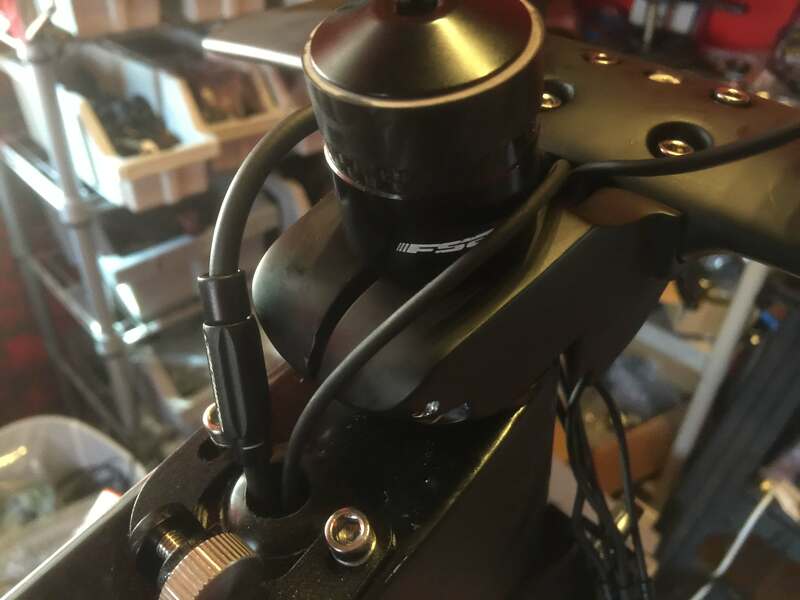 We have not mounted this yet as it requires cutting the steerer flush (very short) with the stem, and we wanted to make sure Lis was happy with the bars and fit before cutting the steerer. 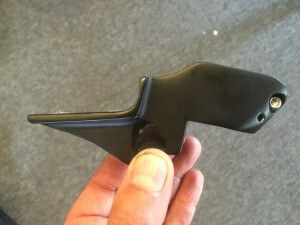 Once cut, you will be hard-pressed to fit a standard stem to it (other than a low profile model like a Syntace or FSA). 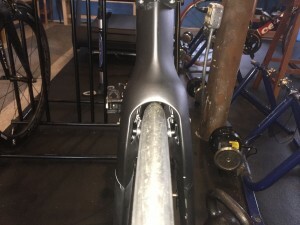 The top tube of the frame has a single hole behind the stem for derailleur and rear brake cabling, and the basebar has a port in the center trailing edge for cables/wire entry. All in all it was a fairly straight forward and clean build as far as super-bikes go. No real gotchas, everything fits perfectly. 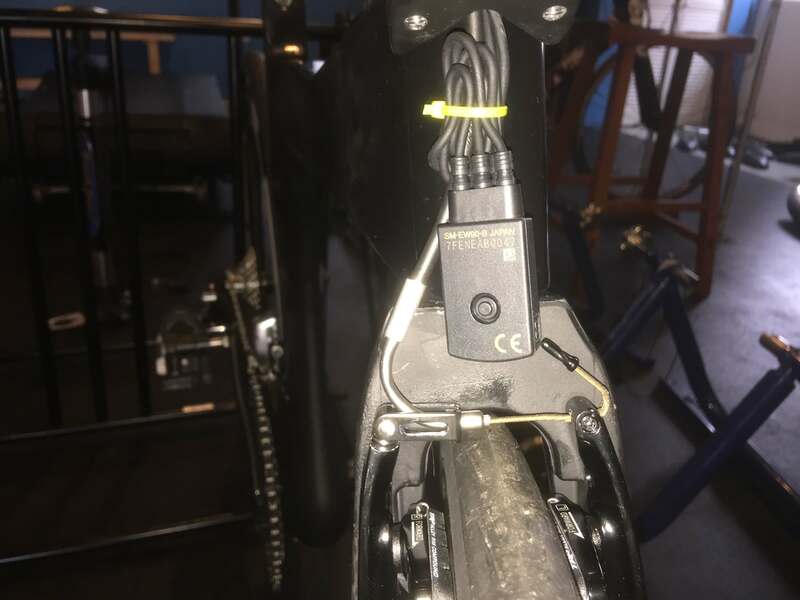 The rear brake, mounted underneath the bottom bracket, is a Shimano direct mount, which provides easy setup and superior braking versus most other aero brakes. 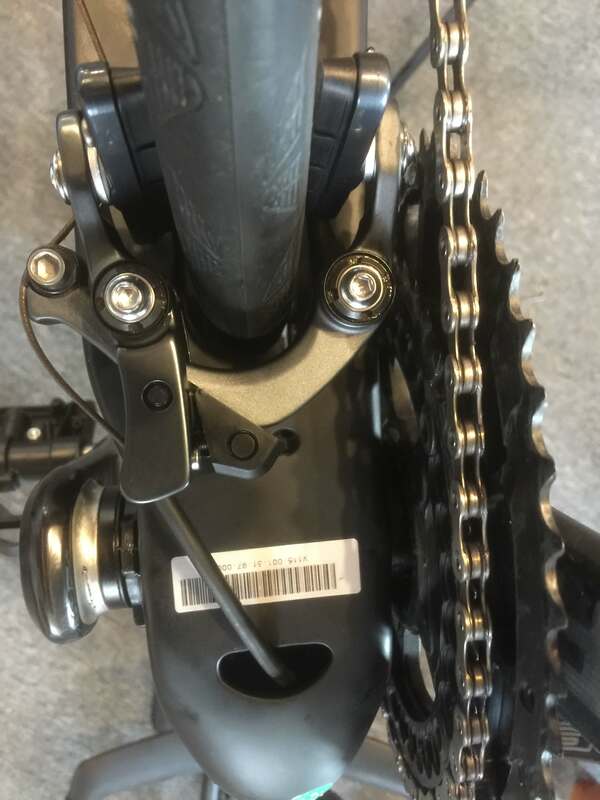 Bottom bracket is BB30 meaning it can be adapted to just about any crankset and bb system out there. The bike should be an easy one to live with mechanically, especially for a super bike. Side view of the Ventum stem. Ventum stem and bars top view. Cable exit port in rear of basebar with orange guide tubing. Ventum stem and bars underside. Note the V-shaped notch for the faring and the round cable port. Ventum stem and bars side view. 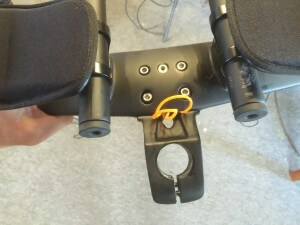 Ventum stem and bars with stem cover in place. The steerer must be cut flush with stem in order to use this cover. Side ports allow cable routing. 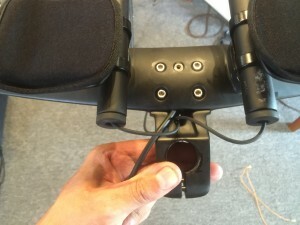 Rear view of bars with Di2 wires and brake housings. 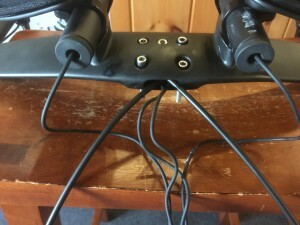 Top view of bars and stem with cables and wires routed through stem port. Stem and bars mounted to steerer and cables routed through top tube port. 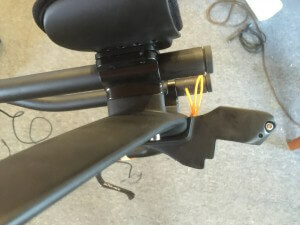 Here we have left the steerer long in case we wanted to change bars, hence the stem cover is not installed. 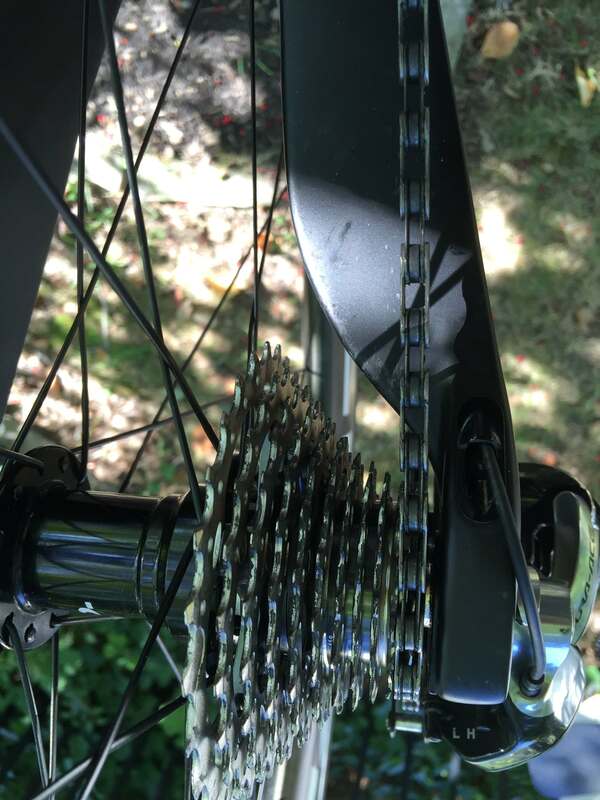 Faring for front brakes and cables – before trimming to length. Front view of fork and head tube before faring is mounted. 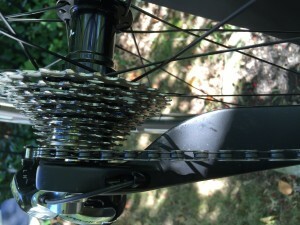 There is enough room in the faring to hide the Di2 junction A. Front view with faring installed – very clean. 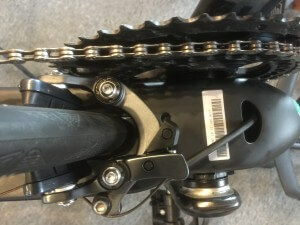 Shimano direct mount rear brake. One of the other main features of the One is the integrated hydration system. 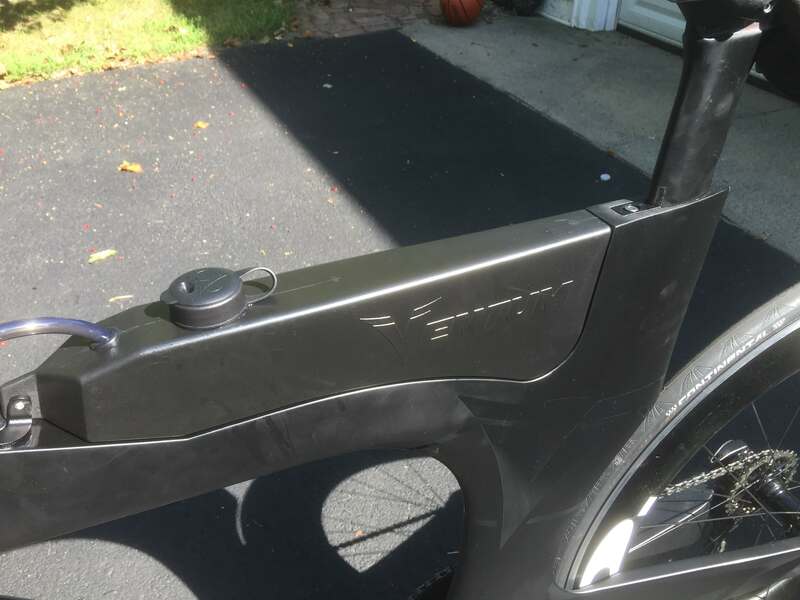 A plastic tank completes the aero shaping of the top tube and holds 40 oz of fluid while improving the aerodynamics of the bike. This system is elegantly simple in that the tank plugs into a hole in the frame “seat tube” and attaches with an adjustable thumbscrew mount in the front. It blends in seamlessly and does not rattle or move. A soft rubber fill cap is easily removable for refilling and cleaning. A hose, bite valve and magnets provide for easy drinking while aero. 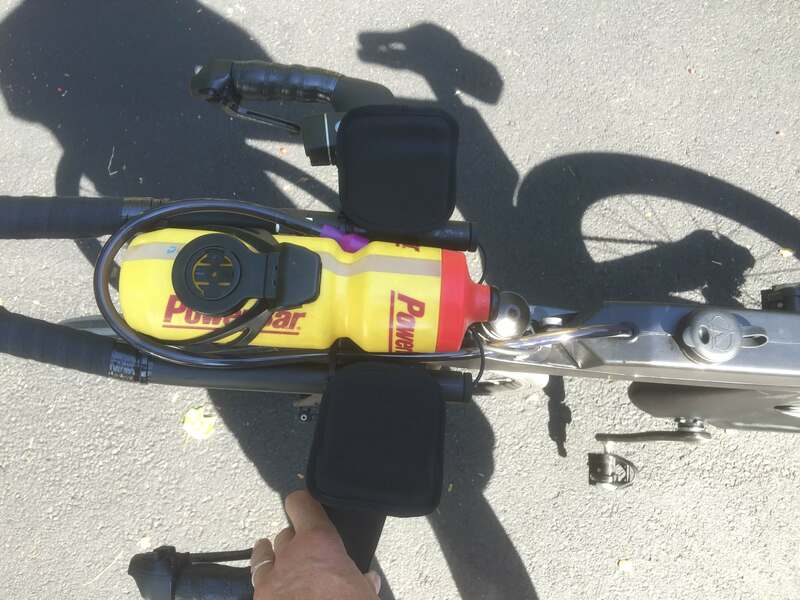 Add a BTA bottle on the aerobars, and you have all you need hydration-wise, with nary a watt wasted. The hydration tank fits cleanly and doesn’t rattle or move. The front of the hydration tank held by a thumbscrew to an adjustable mount that can be moved fore/aft for a snug fit. The rear of the hydration tank simply plugs into the frame. 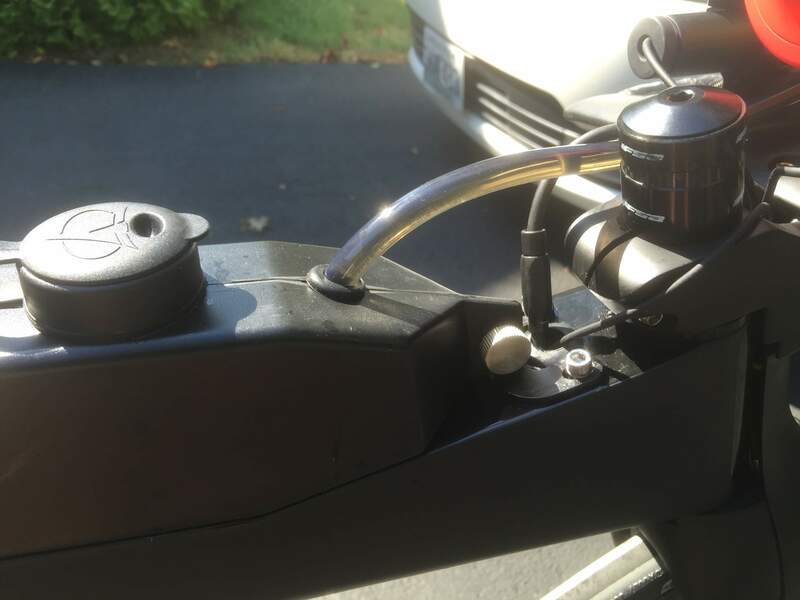 A super-clean front end with easy access to the hydration tube from either an aero or sitting up position. The frame stack/reach is fairly middle of the road – not overly aggressive nor conservative. 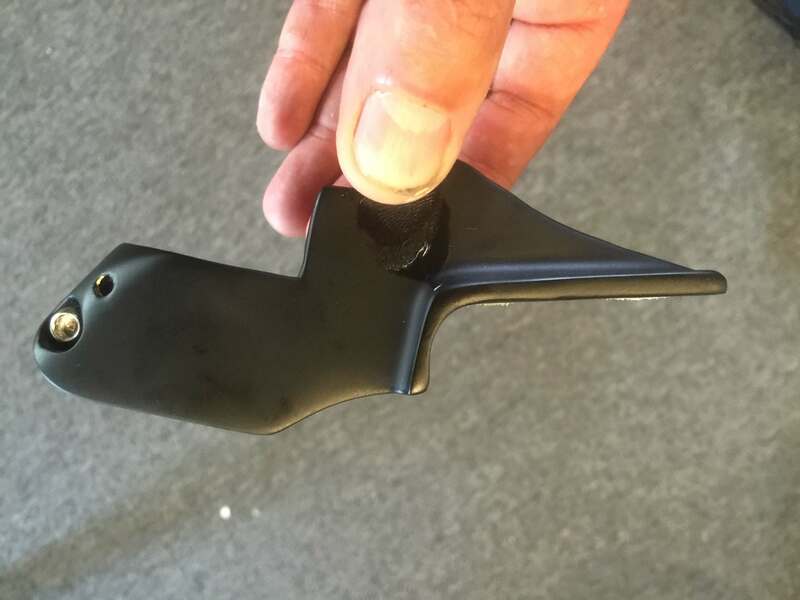 The stock aerobar/stem system provides a minimum of approximately 9cm of stack. In other words, add 9cm to the published frame stack and that gets you the minimum “cup stack” achievable with the stock bars. The stem is a short 75mm, but when combined with the aerobars which have relatively forward-mounted cups, the minimum cup reach (reach to back edge of aerobar cup) is approximately frame reach plus 3cm. 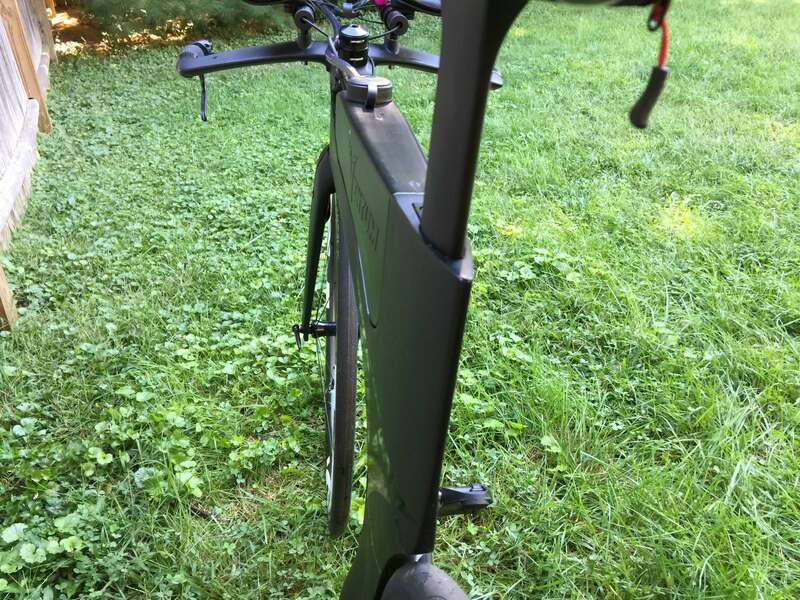 How does this compare to a typical traditional front end setup with a standard stem and “typical” aerobars with 6cm of stack and -6cm of reach? 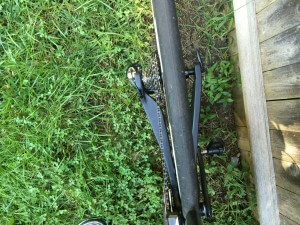 It is very close to using a -17 degree (level) stem, 10cm long, with a 1cm steerer spacer and the aforementioned bars. 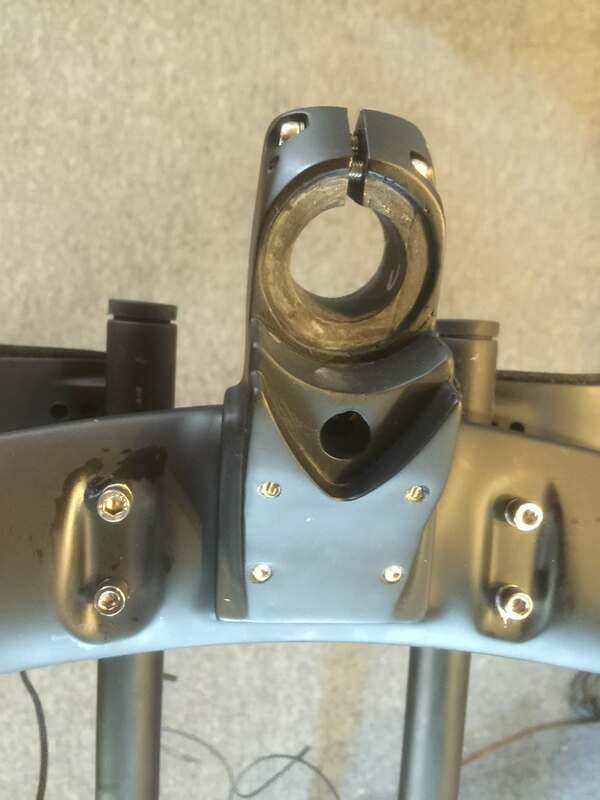 Note that the stock Ventum bars come with pedestal spacers that can raise the extensions and cups 1, 2 or 3cm. 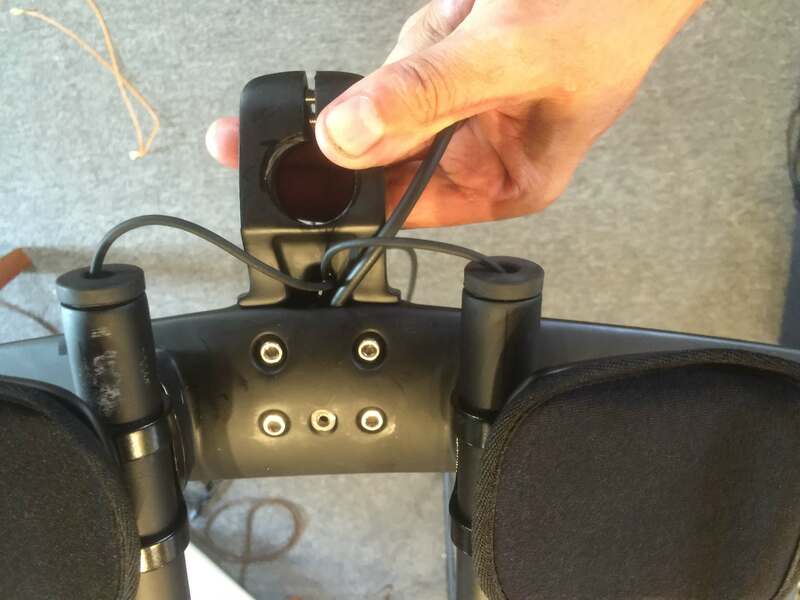 Reach can be adjusted another 1.3cm forward using the second set of holes in the cups. And, you could use some steerer spacers as well under the stem for additional stack, at some small aero penalty. 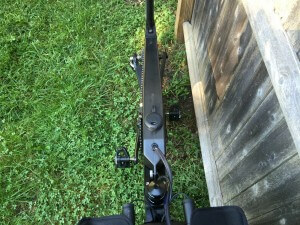 Note that ideally, you will not want to be pedestaling the bars up too high or you may find the basebar grips too low for you. They have a decent amount of drop built into them – the minimum drop from the pads to the grips is 7.5cm. This compares to the above traditional bar setup which would have~ 5cm of drop if using a flat basebar. Or, you can scrap their front end and add your own for more fit options. 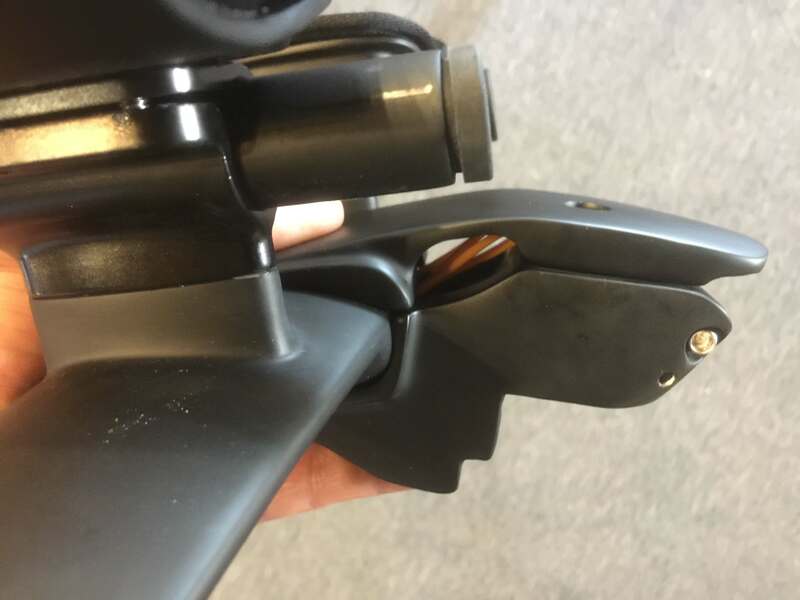 So far we have found the stock aerobars with shallow ski bend extensions to be quite comfortable if you don’t mind the basebar position and are fine with a maximum pad width of about 21cm (the two other width settings are 17 and 19cm). 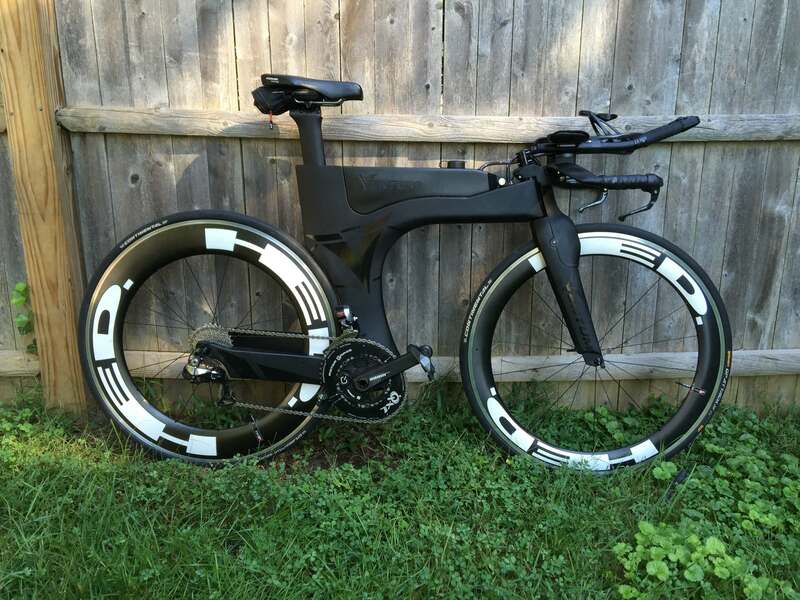 Overall the fit parameters of the bike are well thought out for the likely target market of the bike – aggressive racers with good aero fits. The stock setup interestingly just hits both Lis and my fit coordinates in the lowest setting, and we both have quite aggressive positions. One issue for some riders will be the standover height due to the hydration tank. The 51cm frame (the smallest current size) has an 80 cm standover. Ventum has indicated they may add a smaller frame size, and I could also see them offering a lower-profile hydration tank option. At 51cm stack / 39.4 cm reach, the 51cm frame is not particularly small so if demand is there I could see them going down to a ~48 cm stack / 38 cm reach option. Another challenge is where to put food for long races on such a clean integrated ride. 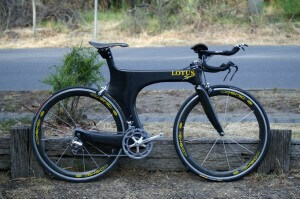 The aero answer is “nowhere – hide it somewhere else” but long course folk will want an on-frame solution for this. Ventum is rumored to be coming up with one. I could see an optional hydration tank with a reduced 30 oz of capacity with the rearward 20% of it being a covered box for nutrition. Certainly one advantage of the integrated hydration tank design is that it can be modified far more easily than the frame can. I have not ridden it – I am not sure a size 58 exists yet. In any case, Lis has a few hundred miles on hers including a 100+ miler at IM tempo and an Olympic distance race. She loves the handling and responsiveness of the bike, and based on her splits in the race (24+ mph in the middle loop of a rolling course with 2 hairpins) and my experiences riding behind her, it is fast. Not scientific of course, but if she feels like it is fast, I am confident it will be in Kona. It was very windy and gusty during her 100 miler, and she felt like it basically ignored crosswinds – another bonus for Kona. The hydration system works beautifully. The tank shape allows every last ounce to be easily extracted, and the flexible hose and magnetic mount makes for convenient drinking with no aero penalty. She is looking forward to refilling on the fly less with the huge 40 oz tank capacity. 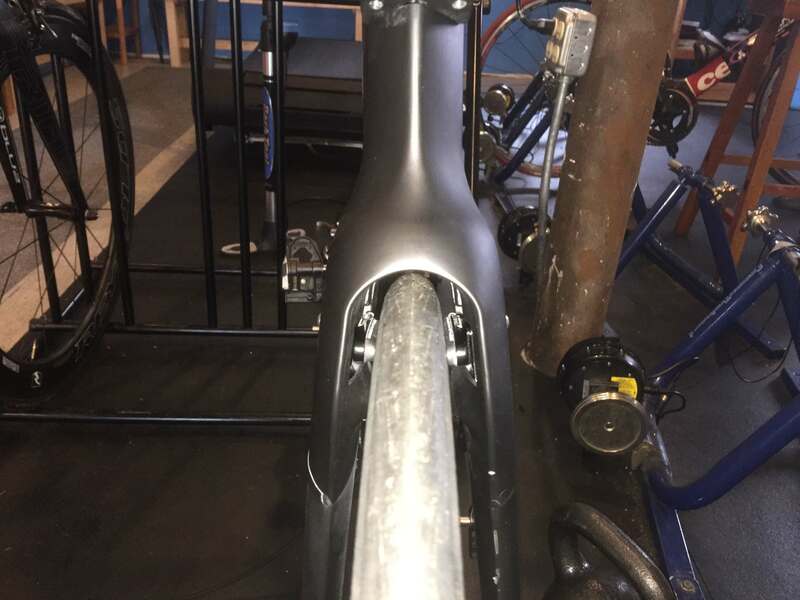 The bulge in front of the bottom bracket looks like the bulbous bow used on large ships to reduce drag. The frame has a decidedly fish-like profile when viewed from above. A smooth, piscine taper front to back. The chainstays are decidedly asymmetrical and quite stout. 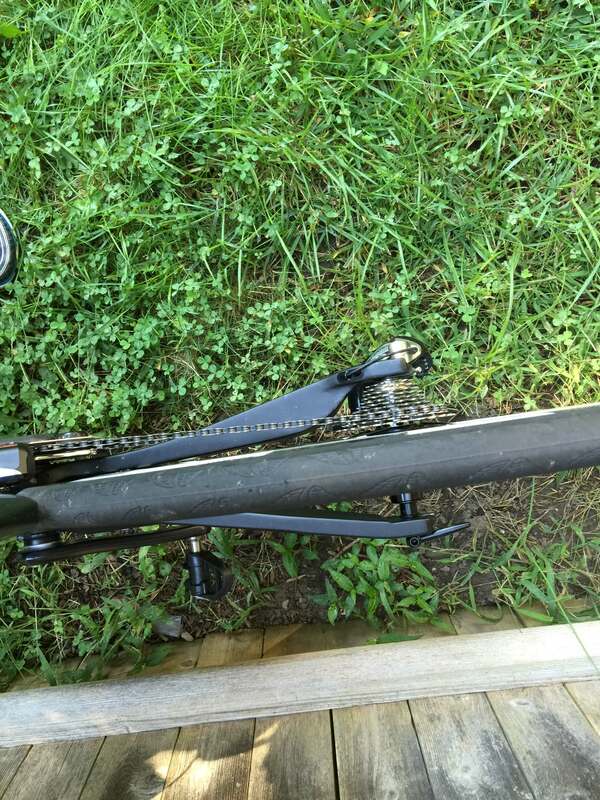 The beefy right chainstay adds stiffness and appears to shield the cassette from air flow. In conclusion, the Ventum One looks like a winner. Is it the fastest bike out there? Who knows – maybe time will tell. I am confident however that it is fast, at least competitive with any other exotic design. And if you own one you will not look like everyone else, at least for a while. So I think it is definitely worth checking out if you are in the high end of the market and do not want to default to the usual choices (of course it must fit you, and a crappy fit will more than outweigh any aero benefits from the frame). 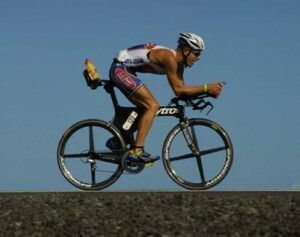 Expect to see plenty of these bikes next season at big races.